With a 1 day or 3 day ticket, passengers can explore New Orleans on an iconic City Sightseeing tour bus! Customers will enjoy access to 18 tour stops along the route where they can hop on and hop off as they please and explore at their own leisure! Enjoy panoramic views from the open-top, double-decker tour bus as this tour takes you to the city's most wonderful sights and attractions, including Jackson Square, French Market, Harrah's Casino, National WWII Museum and the Louisiana Superdome! With your ticket, you will also be able to enjoy a live English tour guide and a free walking tour! 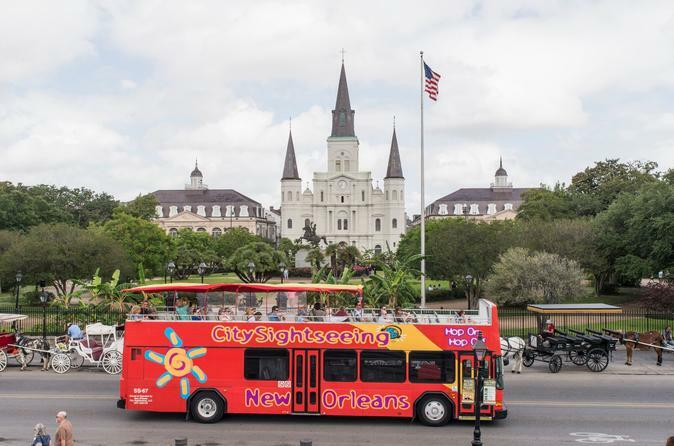 Hop on to this wonderful City Sightseeing bus tour through New Orleans at any of the 18 tour stops conveniently located around the city. If you’d like to start the tour from the very beginning, than hop-on at the iconic Jackson Square. The square is famous for being one of New Orleans’ National Historic Landmarks, featured in numerous films and TV and for being the home of dozens of attractions. Hop-on and continue to the French Market, a cultural hotspot in the city, boasting many stalls that sell the local cuisine and handmade goods! It’s a great place to hop-off and explore if you’re looking for an entertaining and fun attraction. Another fun attraction to follow is the Harrah’s Casino, hop-off and discover one of the city’s largest casinos. A unique attraction along the route is the Louisiana Superdome, hop-off to discover this famous venue and admire its unique, contemporary architecture! If you’d like to explore some history during your tour of New Orleans, hop-off at the National WWII Museum, one of the city’s most popular tourist attractions, and enjoy a wide range of war exhibitions and galleries. Take a break from the tour and hop-off at Magazine St, which is arguably the best spot along the tour to do some shopping, enjoy a bite to eat or go for a drink or two in one of the many vibrant bars along this impressive 6-mile street! Hop back on to the tour when you’re ready to discover more famous attractions including Mardi Gras World and the Arts District! Magazine Street & Jackson Ave. Buses depart roughly every 30 minutes from the tour stops listed above.